A revised Master Plan was approved and replaced the previous plan effective June 19, 2013. The changes were relatively minor and provide for more planting bed spaces and a slightly different arrangement of the sizes of the beds. 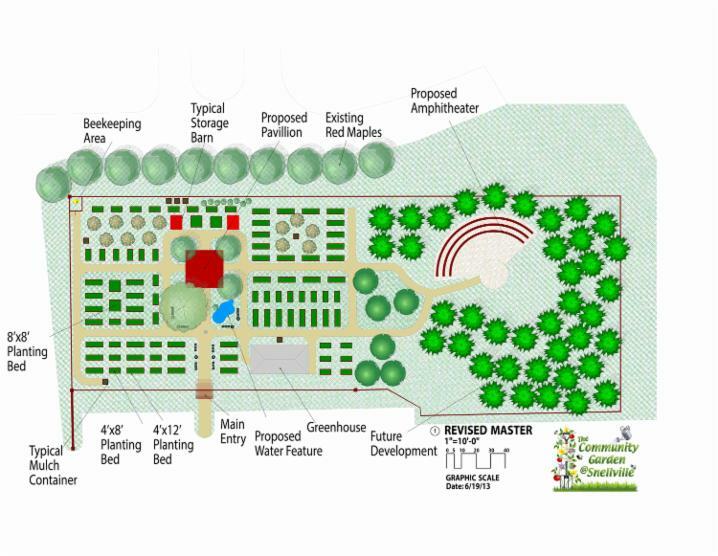 The Community Garden @ Snellville committee developed a master plan in 2012 with citizen input to determine the proposed layout and phases of the garden over the next few years. That plan was revised on June 19, 2013 to the Master Plan seen above. for approval of changes or additions to the master plan. information. A form to submit a request is attached. 2. A brief description of what is to be changed or added to the master plan. 3. Where on the master plan is your suggested location for the item to be added or for the change to be made. 4. What type of material is the item made of—wood, concrete, metal, etc. be seen locally, at what store or location. 6. What are the maintenance requirements and who will be responsible for the upkeep. 7. Provide a brief summary of why the change or addition would fit in the garden. to the Community Garden @ Snellville committee pending approval or denial of the request.